I have never worn jeans for work. Except maybe the day we had a spring clean in 2010. Since my time in the Girl Guides I always follow the old BP motto Be Prepared. If a customer, board member or councillor needs to see me I wouldn’t want to be inappropriately dressed. Some dress codes insist on no denim; others say no jeans. There are codes which say smart jeans are OK but not distressed, bleached or fringed (excuse me, when were these policies written?). My take is this. Jeans are inevitable, and in many circumstances fine for work. Many people find them comfortable. Styled well, on the right person, in an appropriate role. Not for senior managers but fine for the front line team. Let’s have a look at what men at Notting Hill Housing are wearing these days. Last Friday (which is not dress down day at Notting Hill because every day is dress down day), I talked to a couple of Housing Officers who look after our tenants. Their job involves meeting customers in their homes, making sure they pay their rent, getting repairs organised and all other matters. They need to be approachable with just enough authority to show they know their stuff without being intimidating or too “official”. 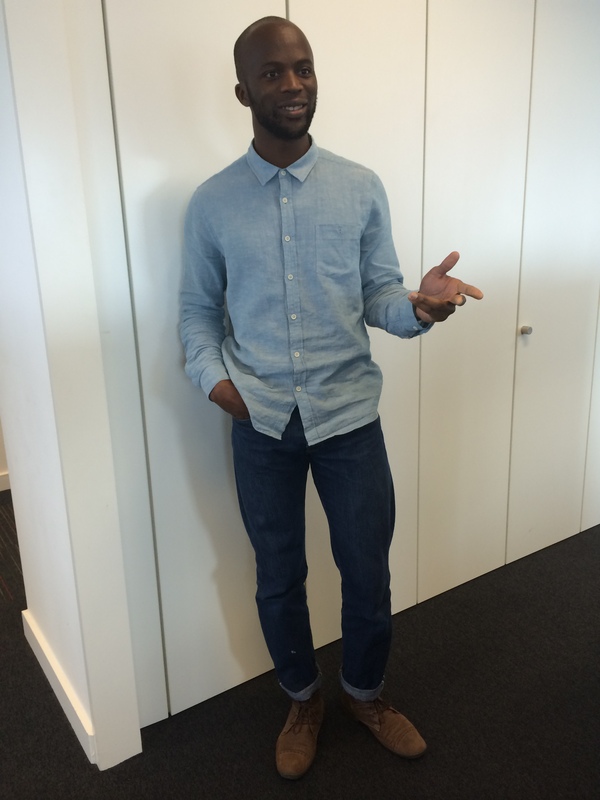 Here is Housing Officer Ade who I think looks very nice in his jeans. Even though he has teamed them with a denim shirt he has a great sense of style and the whole look is composed and beautiful. His use of colour is very pleasing – cool blues with fashionable brown shoes. He wears a smart, but informal shirt rather than a T-shirt, and it is done up to provide a neat neckline. The narrow turn ups on the jeans individualise and smarten them, bringing the lighter blue in to echo the shirt. This outfit on someone with deep-cool colouring is harmonious. Ade is very slim and quite tall, with a straight body outline. The horizontal lines – turn-ups, contrasting shoe colour and fairly stong contrast between shirt and trousers provides a great look for Ade. Now let’s meet Chris. I know it was a Friday but I don’t think this outfit is really acceptable for work. And the jeans aren’t the problem are they? It’s the footwear and the comedy T-shirt. The trainers look like he has cloven feet, or perhaps they are inspired by Geisha? And what exactly does this T-shirt say? When I asked him Chris mentioned a film “that your kids must have seen” – but I don’t think a humourous T-shirt works at work. It is saying “I am young and fun!” Finish it off with a hoody and we have a relaxed weekend look for a handsome family guy. Chris has a good haircut, beard and glasses and could certainly carry off a more grown up look. In this outfit he looks a bit too unstructured and possibly unprofessional. There are visual lines going vertically, horizontally and even diagonally (even on his shoes) making Chris look chopped up and more like a diagram than together. Chris has a sense of humour and he is a great member of staff, but if he turned up at my house to encourage me to pay my rent I would wonder if he knew what he was doing. He reassured me that he was just working in the office on Friday and would not be meeting any customers. Now meet two people in our marketing team. They are generally office-based rather than customer-facing. If you look at these two they have basically created a long, dark, slim line. In some ways this is the most flattering way to dress if you want to look taller and slimmer but it can be very predictable and samey as the men go round looking like dark blue or grey pencils. Hello Mohsin. Mohsin told me he used to wear a suit or at least a shirt and tie, but has felt peer pressure to dress down. He feels so long as you wear a collar (a shirt or a polo shirt) with jeans that makes them OK for work. Mohsin’s colour scheme is quite nice but I think the whole outfit needs a bit of a lift. The shirt has epaulettes which have an authority association but the sleeves are rolled up in a casual way. And I like the colour the subtle check gives him. He could experiment with a wider range of deep colours in his shirts and try a better quality, slim fit style. Mohsin could also try leather shoes and belt. These two elements would allow him to become a bit more expressive in his style, and give him more authority, especially if he feels under pressure to dress down. And the turn up are OK because the whole outfit is one, deep tone. But on a shorter frame it is best to avoid horizontal lines. Andrew, whose marvellous teeth can not be English (he’s #Canadian – yay! ), is also involved in marketing our homes. Andrew looks smart in grey-blue jeans and toning suede sports shoes, with a light coloured sole. His shirt is elegant and his whole well-groomed look is neat and attractive. And yet Andrew who has much lighter, and warmer, colouring than my other “models” is wearing the same deep blues and greys. Its beginning to look like a uniform! Andrew might like to try some lighter and warmer shades for work – pastel shirts with his jeans perhaps? Cream, lemon or peach would look great. As he is tall and slim Andrew could carry off a bit more contrast between his shirt and trouser shades. Perhaps wear a light blue shirt and blue jeans but try tan brogues and belt to bring out the light warmth of his look. A piece of advice I received was to dress for the job you want, rather than the one you have. If you desire to be taken more seriously, and be considered for a move to a more senior role begin to act like you are already doing it, including looking the part. This is hilarious! Congrats Bola ;)! Ignore the peer pressure Mohs! P.s. Chris is right, I do know what film it is…! Wow – what a handsome group of men! (Am I permitted to say that?) I agree with your analysis and agree that Ade’s look is very stylish. I enjoyed the crack about the teeth, although not all of us have great teeth. In general we do get orthodontic work, but not to the degree that the Americans do. I had braces but then my bottom teeth moved out of alignment again by their own accord and I’ve never had them fixed again. I always enjoy your analysis!